Lodges como en Tented Camps. Teníamos a Good Luck, un genial guía-conductor que hablaba español para nosotros solos y un jeep privado para movernos a donde quisiésemos en cada momento. Terminado el safari debíamos decidir en qué lugar queríamos pasar unos días de relax. En vez de volar a Zanzibar, decidimos perder unas horitas más de vuelo y elegir Seychelles como destino paradisíaco. Y fue la mejor decisión que tomamos. ¡Qué hoteles -el Constance Ephelia en la isla de Mahé y el ConstanceLemuria en Praslin- y qué playas!, de nuevo dejándonos una sensación indescriptible y un sabor de viaje «irrepetible». Otro detalle a mencionar que nos gustó mucho es que Miguel estuvo pendiente de nosotros durante nuestra estancia allí preguntándonos por WhatsApp que qué tal íbamos, un pequeño gesto que agradeces enormemente. Muchas gracias por todo Miguel y enhorabuena por tener una agencia tan buena como Nyala Tours. For our honeymoon we wanted to do a safari and finish with a week in some paradisiacal place. We met Nyala Tours through internet and now we can say that the excellent comments that this agency has are completely deserved. From the first moment we got in touch with Miguel we knew that we wanted him to organized the trip for us. Miguel has lived many years in Kenya and dominates the safari concept. By the dates of our trip he commended that we should go to Tanzania, among other things to see the migrations of wildebeest and so we did. 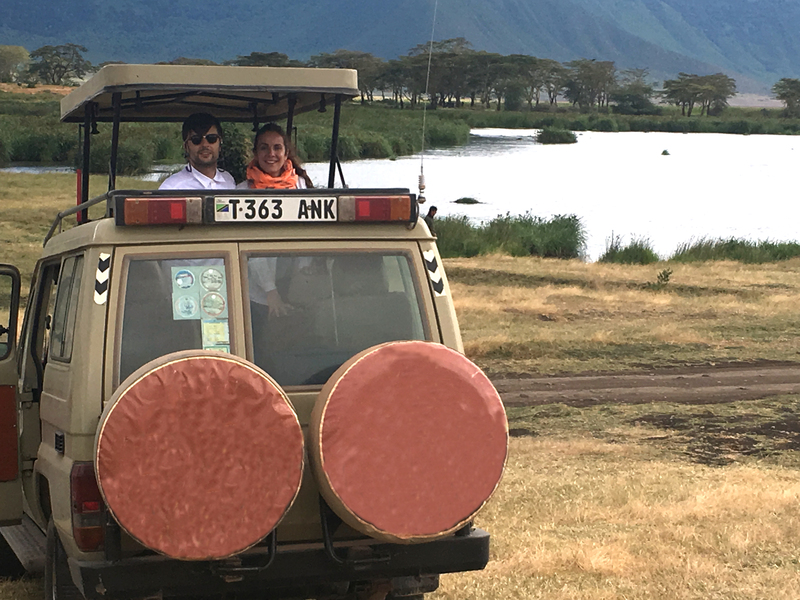 We spent 8 spectacular days doing a safari in the 4 best National Parks of Tanzania: Tarangire, Lake Manyara, Ngorongoro and Segrengueti and staying in unique places, both in lodges as in Tented Camps. We had Good Luck, a great driver-guide who spoke Spanish just to us alone and a private jeep to move wherever we wanted in every moment. Having finished the safari we had to decide where we wanted to spend a few days of relaxation. Instead of flying to Zanzibar, we decided to spend some more flying times and choose Seychelles as a paradisiacal destination. And it was the best decision we made. What hotels! – the Constance Ephelia on the island of Mahé and Constance Lemuria in Praslin – and what beaches!, again leaving us a feeling that is «indescribable» and a taste of travel that’s «unrepeatable». Another detail to mention which we liked very much is that Miguel was watching over us during our stay there contacting us in WhatsApp wondering of how we were doing, a small gesture that you greatly appreciate. Thank you very much for everything Miguel and congratulations on having such an agency as good as Nyala Tours.